The employees union of UNRWA, the UN agency responsible for providing services to some five million Palestinian refugees, announced Thursday, in Gaza, that the employees would escalate activities against UNRWA’s administration, in the latest of widespread protests targeting the agency over the past several months. General-Secretary of the UNRWA Employees Union in Gaza, Yousif Hamdouna, told Ma’an News Agency that the actions were called after the agency and its employees reportedly failed to reach an agreement regarding the union’s demands, saying that the general commissioner of UNRWA decided to halt negotiations and procedures that could facilitate the demands of the union. Hamdouna said that the decision by UNRWA indicated their “irresponsibility,” and that the agency was not concerned with solving the current crisis with its employees, and accused the agency of creating the crisis for refugees and its employees. Hamdouna highlighted that UNRWA’s decision was “unjustified” and “aims to break the spirit of employees and defy their determination,” and noted that the union was willing to participate in “serious negotiations”, in order to find a solution, and hoped that UNRWA would have “enough sense” to solve the situation. He also made clear that the union did not wish to obstruct services to Palestinian refugees, but that UNRWA administration has forced the union to take up such actions, and called upon all Palestinians to stand by their side. Directing a message at the general commissioner of UNRWA, Hamdouna said that the commissioner had two choices: find a solution for the crisis or admit his inability and resign from his position to make room for someone else who can find a solution. UNRWA, meanwhile, has denied that negotiations have failed, as the media consultant of the agency, Adnan Abu Hasna said that meetings were still ongoing between the unions and UNRWA’s administration, and that the decisions presented by the general commissioner were being considered. However, as of Friday, the specifics of the general commissioner’s decisions remained unclear. UNRWA spokesperson Chris Gunness confirmed, on Friday, that negotiations were still ongoing with the unions, and that the agency was continuing to listen to the demands of protesters. “It is unfortunate that some of the unions are seeking additional gains by interrupting services to Palestine refugees in the West Bank and Gaza, closing offices and effectively causing their members to lose pay for not working instead of engaging in dialogue,” he said. Strikes against UNRWA in the besieged Gaza Strip and the occupied West Bank, including East Jerusalem, have been frequent in recent months, with at least 1,000 UNRWA workers going on strike last month in Gaza after leaders declared negotiations with UNRWA “frozen”. However, less than a week later, the union halted their strike after meeting with UNRWA’s general commissioner and agreeing to form a committee to find solutions for the union’s demands, Suheil al-Hindi, the head of the union, said at the time. He also said that the UNRWA administration had responded positively to the union’s demand to fill a number of job vacancies and had hired 200 new teachers, with 200 others to be hired in January. 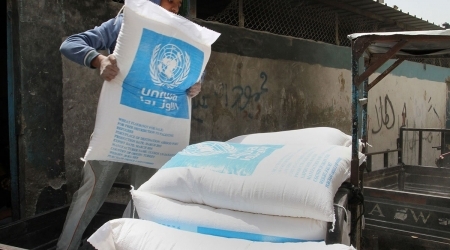 Al-Hindi reiterated last month that the union was also calling for an end to UNRWA service cuts across the Middle East, and an increase in salaries for local staff. The union, according to al-Hindi, has also demanded that UNRWA increase salaries to reflect the high cost of living and to stop reducing services the organization offers to Palestinian refugees. UNRWA’s director of operations in the Gaza Strip, Bo Schack denied on Oct. 17 that UNRWA had reduced any services to Palestinian refugees despite the severe funding shortage. “UNRWA is exerting huge efforts in Gaza and there have been no reductions in services at all,” Schack said, during a news conference at UNRWA’s headquarters in Gaza City, where he claimed that the total number of UNRWA employees had, in fact, increased. While UNRWA has denied allegations in the past that the changes to refugee services were an attempt to develop more cost-effective procedures in order to alleviate a financial crisis in the agency, Palestinians have accused the agency of sacrificing the well-being of Palestinian refugees in order to make up for their financial strains. The plea came one year after the organization faced the largest financial setback in its history, with a recorded deficit of $100 million.